Description: Train 556 rolls under the NY 7 overpass in Conklin, just minutes into its trip to a CSX connection at Park Jct in Philadelphia. Description: Train 556 is ready to go out of East Binghamton late on a Saturday afternoon. Description: An afternoon surprise, SECS usually an evening train here! 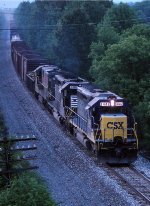 Description: CSXT 8447 & CR 6091 are seen leading a coal train east passed Mexico Tower in Cumberland MD. Description: CSX 8447, 8515 & 5554 are seen leaing Q137-01 west past Q401 at North Branch, MD. Description: A westbound autorack glides out onto the 150 ft tall span. Description: A little wider angle of Marcy Trestle. Description: A close up of the horses. Not the sharpest I know but my good lense is being repaired. Title: The reroutes strained the C&O crews to the limits. Description: At the Belle Mead detector, 1839 hours. Description: In this driver's eye view from Marion Street, CSXT 8447 brings Q50022 west across the IORY diamond. Description: Eastbound on 2 at 58th Street. Description: Q 265 came off the B&O and is making his way south. There is a 25mph speed restriction at the bridge below the coil car. Has the look of a combined Q 247 and Q 265.